The Magnetic Stripe Reader easily reads credit card information directly into the Check-Inn property management system. 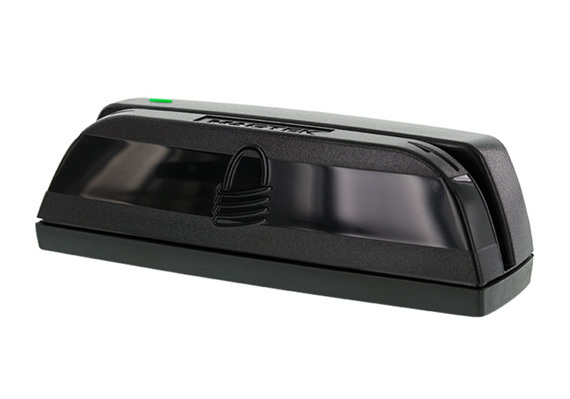 A Magnetic Stripe Reader is recommended to streamline front desk operations so that the desk clerk does not need to manually enter credit card information into the hotel software. The mag stripe reader is also strongly recommended for use in conjunction with the Credit Card Processing Interface for your Check-Inn hotel software. A limited number of states have a magnetic stripe printed on the back of the driver’s license. Driver’s licenses with a working magnetic stripe can be swiped through the magnetic stripe reader and the encoded information will pre-fill into the Check-Inn property management system. If you are in a state that does not have a magnetic stripe, or a good portion of your guests are from out of state, the Advanced ID Scanner is the best option for your property. Innsoft offers employee password cards which are used in conjunction with the Magnetic Stripe Reader. Once the card is programmed, it can be swiped through the mag stripe reader to log into the Check-Inn hotel software. This replaces the need for employees to remember individual passwords. Don’t see the hardware option you need? Let us know via our online feedback form. We are passionate about developing creative, cost-cutting property management systems.